WHY WAS THE PILOTS' ATTENDANCE SO LOW? William Daley's "one more year" threat was important, but it wasn't the only factor which impacted attendance. A rash of injuries resulted in a miserable 9-20 record for July, which the Pilots followed by losing 22 of 28 games in August, including an entire 10 game home stand. Some have argued that the condition of Sick's Stadium was a big contributor to the Pilots' box office woes and that's probably true. At the direction of the American League, the city expanded the stadium to 25,000 seats, but disagreements with contractors and harsh winter weather meant that seats were still being built during the team's home opener. A rash of related problems continued throughout the season, including water pressure so low that toilets that wouldn't flush when the crowd reached around 10,000. "We'd pass the complaints along to the city, but they didn't know what to do." remembered Pilots public relations director Bill Sears. "I don't know what you could do--you couldn't tear the plumbing out in the middle of the season." 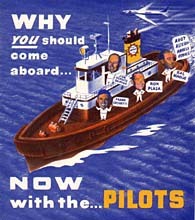 1969 season ticket brochure, with Joe Schultz and coaches piloting a tug. Local newspapers raised a stir about the Pilots' ticket prices, which topped out at $6the highest in baseball. The issue alienated a lot of fans, even though all those seats had been sold before the season began. A bigger factor that's seldom mentioned was that the remaining seats were relatively expensive and many of them had poor views or no backs. Concession prices were also the highest in baseball, which also hurt the bottom line, especially when Boeing's financial problems sent the area into a severe recession. The Pilots had no television deal. TV station officials claimed that team owners were asking exorbitant prices for the broadcast rights. "I don't think that's true," countered Max Soriano. "The cost of the A.T. & T line was such that we couldn't get advertisers to come forth. There wasn't any revenue for the ballclub by the time you paid the telephone charges." Regardless of who you believe, it hurt the Pilots at a time when television was becoming a vital marketing tool and an increasing source of revenue. Finally, there was little money for promotion and advertising, which meant that owners had to rely on their product selling itself. Considering the above problems, that was too much to ask. Whether the Pilots moved because of greed, ego or incompetence, the real bottom line is that millions of Seattle kids grew up without going to a game with their dad.